Enjoying a highly positive weekend of racing in Moirans en Montagne, Loïc Larrieu claimed a double Enduro 2 class victory at round four of the French Enduro Championship. Collecting valuable points, the Outsiders Yamaha Official Enduro Team rider is now enjoying a six-point-lead at the top of the provisional French Enduro 2 Championship standings. Making use of his experience Loïc was able to control each race day. 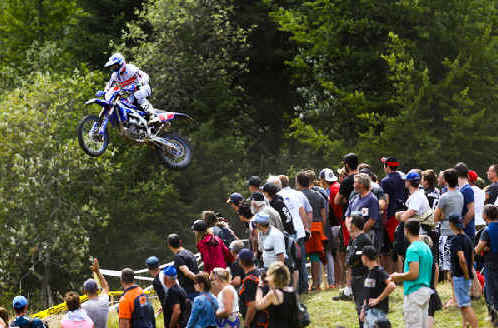 Posting consistently fast times in each of the three special tests in Moirans en Montagne, the WR450F mounted rider managed to earn his first double victory for the season. Heading to the series finale in Brioude on September 15/16, Larrieu will give his all to become the 2018 French Enduro 2 Champion. Enjoying a short break the Outsiders Yamaha Official Enduro Team will be back for a month full of racing action in September. With the following round of the Enduro World Championship taking place in Italy on August 31 to September 2, the final round of the French Enduro Championship will be contested in Brioude on September 15/16. Before these two events, some of the team’s mechanics will race their WR-F machines at the annual Aveyronnaise Classic on September 23/24.